Walking down the “Hausmann-like boulevard” that is Aldwych, Alan Read points out the sweeping curve of white buildings, “it looks like it should be in Paris. I sometimes imagine is in Paris when I want to think of myself flâneuring around the city”. The red busses are a reminder, however, that this is very much “London, doing its London thing”. On Aldwych, north side, looking east. 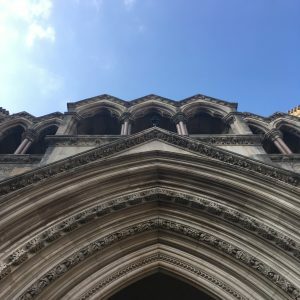 Alan Read, Professor of Theatre at King’s College London, has agreed to show me around the Royal Courts of Justice, a place where he has spent many hundreds of hours researching intersections of performance and the law. 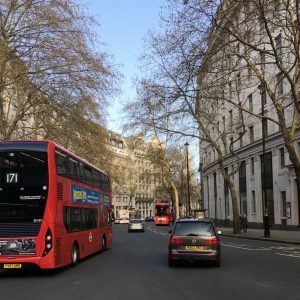 As we walk there from his office, we enjoy the late afternoon spring sun which cuts low under the canopy of trees that line Aldwych and dazzlingly glances off the tops of black taxis. Alan points out St Mary le Strand, a place where, in the seventeenth century, there briefly stood a maypole. Alan explains the so-called “seditionary activities”, the “country dancing” that took place on – appropriately enough – May Day, before the short-lived monument was pulled down. Guild workers would congregate around the maypole on their day off work, to drink and dance and cause a general charivari. Alan explains his vision for a post-Brexit maypole: might it be a place for peaceful gathering? He concludes that it might very well dissolve into a place of “dissensus”, reenacting the 1670s gatherings that so provoked the Puritans. Once at the Court, we take in its pointed arches and turrets. Or, at least, that’s where I’m looking, upwards to the spires. Alan is more interested in what’s at eye level: the ‘open’ sign in the doorway with the hours of the spectacle clearly advertised. Law in England has a long public history, “if you were dunking a witch in a river you did have an audience”, and still anyone can come and view the activities of the courtrooms. Alan explains how the building can be understood as “England’s stage”, at least for the judicial process. It mimicks the fourteenth century, but it is from the nineteenth century. This neo Gothic frontage symbolises the rule of law: the whole area around the Strand, from the Inns of Court to Somerset House all recall the authority of neo Gothic and other medievalist and Classicist styles (not to mention the Houses of Parliament – or indeed, as Alan points out, the spires of Oxbridge – so many people of the legal world pass through buildings that look the same from prep school to workplace). The stonework speaks of (“what we might call in scare quotes”) “civilisation” and “rootedness”. The law needs a sense of ‘history’ in order for it to function, in order to have precedent, and the law is absolutely dependent upon precedent for its processes and power. But, Alan points out, the ideas of continuity across the centuries that this architecture performs “is a fiction”. “The only thing that is continuous about the law is its violence”, as Walter Benjamin would insist [pdf download, Benjamin ‘Critique of Violence’]. This building is where lives may be unimaginably changed. 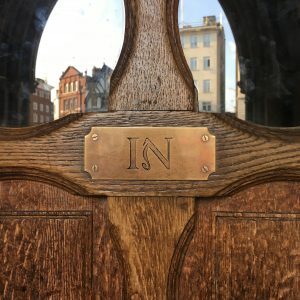 The ‘in’ door at the Royal Courts of Justice. We enter under the proscenium arch, up the short steps (“not very good for disabled access”). “We are folded into the building, the minute we begin to move towards it there is a sense we are being drawn in”. Again, I’m looking up to the vaulted ceiling, but Alan points out the doors: the first “disciplinary measure” at the threshold. Visitors may only enter in through one door and exit out the other. I watch a few people reach out a hand out to push at one door before recoiling and choosing the other, clumsily following the commands of the polished brass plates. Just inside the first doors, we pause at a kiosk to the left. “No one ever did charge to come to the Courts, but this has the feel of the 1930s cinema about it”. He imagines that the Courts may have felt more user-friendly when the booth was in operation. Now we are peering through the windows to the main foyer which is fronted by an X-Ray machine, body scanner, and a team of security guards. Alan will have to sip his lemonade to demonstrate that it’s not poison before we are allowed in, and I have to resist taking photographs. “Aristophanes would call me a trialophile”, Alan explains once we’re inside. He’s apparently a “familiar sight with my sandwiches”, but he is but one of many people who are “effectively living in the building, that supposedly is for legal process, but for a number of people a protection from the weather outside”. I ask Alan whether the architecture and rigmarole of security feels routine for him now. “Foreground and distance do get foreshortened when habit takes over”, but, it’s the people inside that keeps the experience always new. The way the barristers and clerks step purposefully “on zig-zag tracks, moving across the space in the most remarkable ways that tie the building together”. 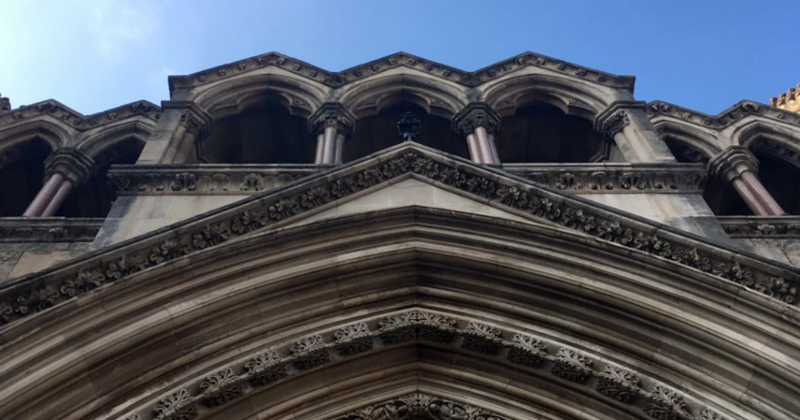 Looking up, the proscenium arch at the Royal Courts of Justice. Most recently Alan has been following a tort case involving Chris Goldscheider, who took the RoH to court after suffering ‘acoustic shock’ during a rehearsal. 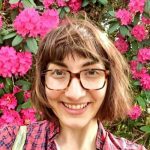 Alan explains “I’m particularly interested in where aesthetics or legal practice meets arts practice, and the problems that arts processes have with legal process. What was so interesting in that particular case was the difficulty that the defence that the RoH mounted, that Wagner could not be considered noise in the sense that a factory is noise simply – obviously – did not impress the judge. He was deeply concerned to hear an argument that suggested that Wagner, or aesthetic sound, could not be noise as constructed within a factory, where industrial relations and safety are all important”. With each case such as Goldscheider’s, arts and cultural productions are tested by and test the language and logic of the law, raising questions about whether or how they may be outside of or stretch precedents. Such cases ask, what intrusions, accidents, or harm may be forgiven or excused in the service of culture? Of course, “the legal process cannot occur without elements of performance … rhetoric, costuming, particular kinds of phraseology, the oath, the time of the law”. Alan explains, “in other words if you don’t perform the law in its durational sense, no one will take it seriously”. Processes must be upheld. But, of course, “the law is confounded and problematised” by some of these theatrical processes that can be manipulated. Alan recalls OJ Simpson infamously expanding his hands “to ensure that the gloves didn’t quite fit, removing himself from legal process through a theatrical gesture”. A final aspect of court life that Alan insists we experience, and he says his students are most often shocked by, is the way that “the animosity of the courtroom gives way to the bonhomie of the boys’ club” of the Seven Stars. 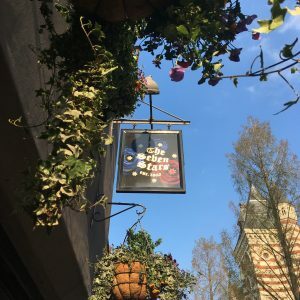 Except for in the most serious cases, visitors can expect to mingle with legal characters at this pub. Here is where Alan finishes his tour, another theatrical space, the windows dressed with Dickensian paraphernalia – taxidermy mice, an ostrich egg, and botanical diagrams. It’s twenty-past four and there’s already a crowd growing. The wigs and gowns are off, one hand grasps a pint while the other shades against the lemon-yellow sun dipping behind the LSE.